You've had truffles. You've had soda. But have you ever had truffles that taste JUST LIKE soda? Get ready! 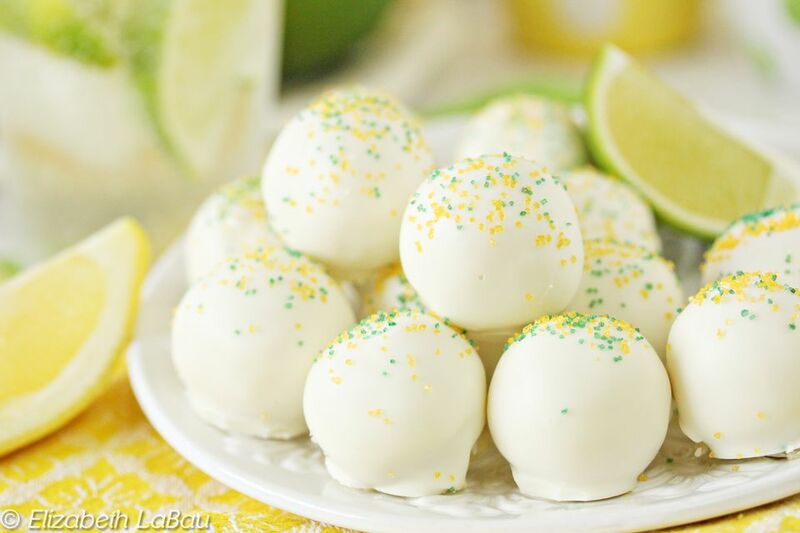 These Lemon Lime Soda Pop Truffles have the sparkling sweet-sour taste of lemon lime soda, as well as the fizzy, popping sensation of carbonation. They're so delicious and unique, you'll want to gulp them down and then go back for more! These truffles are best enjoyed the same day they are made, as the popping sugar will lose its "pop" over time. They're safe to eat for at least 2 weeks after preparation, but for maximum fizz, enjoy them the same day you make them. They do require a few specialty ingredients like citric acid and popping sugar, so be sure to read the notes at the end of the recipe for more information and tips. Combine the chopped white chocolate, the butter, and the heavy cream in a medium bowl. Microwave the bowl for 30 seconds, then stir everything together. If the white chocolate does not readily melt, microwave it for an additional 30 seconds, then whisk until the mixture is smooth. Add the lemon and lime zests, the lemon and lime extracts, and the citric acid if you're using it, and whisk everything in. When everything is whisked together, the mixture should have a thickened texture that holds the tracks of the whisk for a few seconds. It should not be thin like milk, but sometimes, depending on the white chocolate used, the truffle mixture takes a little bit of finessing to get it to emulsify properly. If it is thin after you whisk everything together, continue to let it come to room temperature and whisk occasionally as it cools. You can speed up the cooling process by putting it in the refrigerator and whisking after 4-5 minutes, until it changes from a thin liquid to a thicker truffle mixture. Once mixed, press a layer of cling wrap on top and refrigerate it until it is firm enough to scoop and roll. Once it has firmed up, use a small candy scoop to form 1-inch balls of truffle mixture. Pour the popping sugar into a small bowl, and roll the truffles around in the popping sugar. After the outside of the truffles is coated with the sugar, roll them between your palms to make them round. Refrigerate them briefly while you melt the white coating. Don't do this step too far in advance or refrigerate them for a long time, as the popping sugar will lose its pop when exposed to air and humidity. In a microwave-safe bowl, melt the white chocolate candy coating, and stir until it is smooth and free of lumps. Using a fork or dipping tools, dip a truffle into the white coating until it's completely covered. Let the excess drip back into the bowl, then place the dipped truffle on a parchment-covered baking tray. While the coating is still wet, sprinkle the top with a pinch of yellow and green sparkling sugar. Repeat this process until all of the truffles are dipped. For the best taste and texture, enjoy these truffles on the same day they're made. They can be stored up to 2 weeks in the refrigerator, but the popping texture will really only be noticeable on the first day. Note: This recipe calls for citric acid, which adds a sour “tang” that characterizes lemon lime soda. It can be found in many specialty baking stores and large grocery stores—I found mine in the bulk spices section of a nearby grocery store. It can be omitted, but the sour flavor won't be as pronounced. This recipe also calls for popping sugar, which can be found online and at some cake/candy supply stores. It's an unflavored version of Pop Rocks, so it adds the carbonated fizz without any additional flavoring or colors. If you can't find popping sugar, you can substitute Pop Rocks, just know that it will have the additional flavor or whatever type of Pop Rocks you choose.